There’s been a major breakthrough in records access for those of us with family medical issues that we research in part through our genealogy. Quietly, without much fanfare, the federal Department of Health and Human Services (HHS) has finally come around to understanding that closing medical records forever, even after the death of the person treated, isn’t the way to go. It adopted a new set of rules earlier this year, effective just two weeks ago, that opens medical records 50 years after the patient’s death. 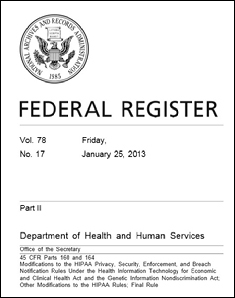 The change — first proposed nearly three years ago1 — came in an omnibus Final Rule adoption governing a vast array of issues under the federal Health Insurance Portability and Accountability Act (HIPAA) designed primarily to update personal privacy rules in light of technological changes in medical recordkeeping.2 The rule was adopted in January and became effective on March 26th. As far back as 2003, archivists had complained to HHS about the old rule, under which personal health information was to be protected forever and only disclosed even after the patient’s death only if the legal representative of the estate authorized it. All of those participating pleaded for clarity — and for access. The new rule is, finally, the HHS response. Now the fact that the federal government isn’t standing in the way doesn’t mean that all of us with family health issues can rush out and expect to be given immediate access to those old health records that may tell us so much about things we face today. The feds have never been the only player in the privacy game — state laws may also restrict access to health information. But it’s a major breakthrough to have the federal government finally move out of the way of access to records of critical importance. Tip of the hat to Ron Tschippert for alerting The Legal Genealogist to the rule adoption! Now if only the medical providers would maintain patient records for that long. In my own work as a personal injury attorney I can rarely find one who has my client’s records from more than a few years ago! I can understand that for sure, Michael, but the rule is very careful to say it is NOT a record retention rule — so no help in the new rule on that score! Hello, May I re-post your article on my blog at http://inmatesofwillard.com/? Thank you! Yes, you may, Linda, and thanks for asking! I have tried to obtain records from Pilgrim Psychiatric Center. My great grandmother died there in 1906. I was told could not find any the request is too far back. Has anyone else found this in their requests. Many records are not retained permanently. I’d check with local and state genealogical societies and medical archivists to see what they can tell you about records access for that institution at that time. Aw, thanks, Jana! You’re so kind to include me!! There is language in the rule that gives covered entities up to 180 days to bring their procedures into compliance with the new provisions. It’s a little outrageous for them to insist on that full period now — the only issue really is how to be sure someone died 50 years ago or more — but that’s what the rule allows. Judy, does this cover mental health as well? I have a great grandmother who was in a state institution at the end of her life and we’d like to know why she was there. It does cover those BUT… and this is a big caveat… those records are often covered by additional and more restrictive state laws which are not affected by this rule change. All the rule does is remove the federal roadblock to access. My g-g-grandmother was in the Boston insane asylum for almost 25 years, she died in 1932. The records are at the Massachusetts State Archives. I have been told that they are protected by MA State law Chapter 123, section 36. I was told that I have two options – (1) open a probate estate file and have myself appointed as administrator of the estate as long as no other heirs at law object or (2) file a court order, essentially suing the department of health in either state, superior or district court and “hope” that the judge thinks that genealogy/documenting my family medical history is a sufficient reason to allow me to see the records. Any recommendations/thoughts of what route would be easiest and least expensive? Should I hire an attorney to help? I’m not at all familiar with Massachusetts procedure, Linda, so consulting with someone who is, would be a good step. You may find a clinic at one of the law schools or the like who can give you some basics. That being said, my guess is that the probate route might actually prove to be the easiest and least expensive. But I would definitely consult with a Massachusetts attorney to get a better feel for whether the probate courts there are amenable to opening a probate so long after a death. I had a relative, my great grandmother’s brother, Martin Farrell who died at Central Islip Hospital 10 December 1904. I have his death cert but there is not indication of any place of burial nor the name of the undertaker who may or may not have claimed his body for burial. I was told that if this was the case that he was likely buried on the hospital property or worst case, his body was used for medical experimentation. Martin died at age 65 of likely mental illness and its complications. This means to me that he had early-onset dementia as did my grandfather and two of his older brothers, all dying in their 60’s. I am now in my 60’s as well and I would LOVE to know just what the problem was, the diagnoses, treatment etc. I am a direct descendant of the Farrell family via my father. It is obvious that in knowing the situation with my Farrell/Burns ancestors it would provide a history of just how prevalent this mental illness problem is in my family. I have two children to whom I would like to pass this information. It is only fair to them in the long term. Getting back to Martin Farrell. In calling the museum rep at Pilgrim Psychiatric Hospital, custodian of the CIH records, there is no record of Martin Farrell being buried there. I am not comfortable with this info as I believe he is indeed there and is burial was not recorded. I have written to the Pilgrim Hospital records area well over a month ago and so far without any response. I am hoping they will consider the fact that Martin has been dead well over 100 years and provide me with his records. Any help or direction would be much appreciated. Thank you for your time and interest. Greg, your best bet would be to speak with experts in New York research such as members of the New York chapter of the Association of Professional Genealogists (see the search by location list at the APG website) and/or those who have credentials as Certified Genealogists from the Board for Certification of Genealogists (see http://bcgcertification.org/associates/index.php) and see if you can get guidance in dealing with these specific repositories. There is no federal law barring your access to these records since your great uncle died more than 50 years ago but there may be state laws you need to contend with. Getting help from someone experienced with these records would be a great help. I’ve been wondering for some time if it would be possible to access the mental health records of Estella (Canady)Carter, my grandfather-in-law’s first wife. She was admitted as a patient at Cherry Hospital in Goldsboro, NC at the turn of the 20th century, when it was called North Carolina Asylum for Colored Insane. There’s a long story here which put an elder half-brother at odds with his youngest sibling. I’d try contacting the individual listed on the Cherry Hospital Museum web page at Visit NC (http://www.visitnc.com/listing/cherry-hospital-museum). I also have been denied access to a family member’s medical records from a mental institution although she died in 1957. I will pursue this as I had thought that I would never be able to obtain the records. I hope that the state of California has adapted this. It will be entirely a matter of California state law, not federal law, given that the person died more than 50 years ago. Hello- My mother (age 83) recently came across her own mother’s death certificate (died in 1936). My mother never knew her mother as she was only two when her mother died. It turns out that her mom had a cancerous tumor removed from her spleen at a major research university a year before her death. We live in Michigan. What do you think are her chances of getting her mom’s medical records since this was so long ago? My mom is the closest direct descendant of her mom and also has a history of organ tumor. What would be our best route? Contacting the hospital and explaining the issue, with support from your mother’s doctor, would be how I’d handle it. I understand the records may not exist, but if they do this would be the likely route to get them. This is great information; I will be sharing it with my class in June (appropriately credited, of course!). Thanks so much!